Main page / Cataract. Causes, symptoms and diagnostics / Can cataract be prevented? What is prevention? Prevention includes all measures directed to avoid the onset of a condition. 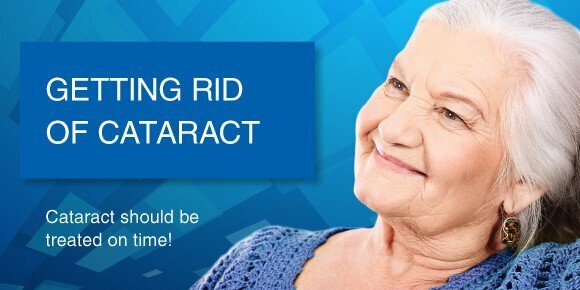 The specific nature of cataract is that it cannot be prevented. If the lens starts to lose its transparency, the process is sadly irreversible. So, cataract prevention in a strict sense is impossible. Currently there are no drugs that effectively help eliminate cataract. The only effective and safe way of vision restoration is surgical intervention. However, compliance with these recommendations are not a guarantee that you will be free from cataract. Eye drops for cataract help slightly delay the process of lens clouding at an initial phase. However, eye drops are not effective for cataract elimination. Treatment of cataract at later phases without surgical intervention is impossible. Can cataract be treated by alternative medicine? Unfortunately, many people, especially elderly people believe in promises and spend a lot of money for miracle remedies, such as cataract glasses, dietary supplements, exercise programs. Some of them resort to folk medicine to avoid surgery. An array of remedies employed by healers is tremendous, including honey, herbs, aloe, castor eye drops, geranium, earthworms, “water of life” and “water of death”, acupuncture, magic spells, potato sprouts, urine, dill, celandine, leeches… These manipulations cannot restore the transparency of the lens. They consume your money and precious time. If you don’t treat progressing cataract quickly, you can lose your eyesight forever due to complicated secondary glaucoma. Ophthalmologists still encounter tragic cases of complicated cataract when it is no longer possible to restore vision completely. Please refrain from alternative medicine when trying to treat cataract! The only way to eliminate cataract once and for all is surgery – ultrasound phacoemulsification.